It’s always a pleasure to come across new brands, new labels, designers doing something different, unique, beautiful. I came across Pleats Mumbai by chance when I was browsing through Frugal2Fab Instagram, and I took an instant liking towards their designs. What are the different Pleats Mumbai outfit styles? From ethnic wear lehengas to gowns, sarees, Anarkalis and fusion wear, this label has a variety of designs and outfit styles you can go for. Their collection is not necessarily bridal but fits perfectly in between pre-bridal and trousseau picks. The dainty outfits are trending this season, with beautiful colours in mustard, peachy pinks, silvery greys and so on. The fabrics are fluid, romantic, whimsical with minimum embroidery. It’s all about the colours, prints, and little details in the garments. 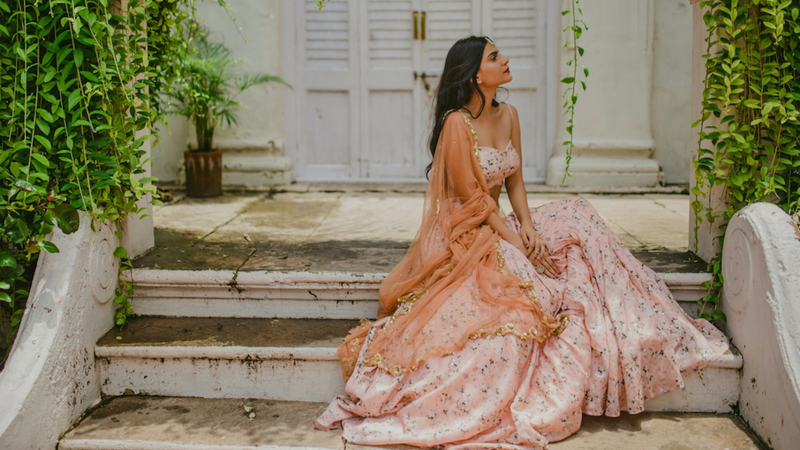 If you are someone who is not too much into big flared over the top lehengas, want something simple yet beautiful, then you need to approach this label. Who are the designers behind Pleats Mumbai? Pleats is the design collective formed by sister duo Kaksha and Dimple Purohit. The brand is all about the pastel hues and indo-western silhouettes. Specializing in lehengas and newly in bridal wear. It brings the drapes, delicateness and dazzling look altogether. Mustards and Greys are trending this wedding season, and these beautiful outfits are perfect to wear from morning to evening functions. Whether you are the bride or the sister of the bride/groom, these outfits will look great on you. One of the more elaborate bridal pieces from the collection, this beautiful royal blue lehenga with the baby pink dupatta is the perfect pick for a spring summer wedding in 2018. The A-line structure of the lehenga and the gorgeous detailing on the blouse looks regal yet keeps the feminine side up. How much do Pleats Mumbai Outfits Cost?